Many people fine it odd that Bettas are shipped from buyer to seller and to and from shows. Because bettas are air breathers they actually are easier to ship than fish that get their oxygen from their water. As long as a few conditions are met, Bettas ship just fine and can be shipped and reshipped as often happens to the show fish. Any fish that is going to be enclosed in a small bag will need to be fasted for a good 24 hours. Fish will continue to put their waste in the water if they are not fasted. Any fish waste is going to be ammonia and any level of ammonia can be lethal to the fish. So fasting is done to keep water quality good. Fish are shipped or should be shipped in insulated boxes. You can get Styrofoam from a local home improvement store like Lowe’s. Then the foam must be cut to fit the box. 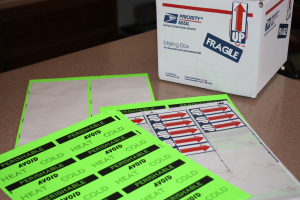 We have a nice article on how to create an insulated shipping box to make that easier for your. If you are getting your fish ready to ship to a show, the article Shipping to Shows will give you all the info you need. Fish must be shipped in clear water in 4″ x 12″ or 4″ x 14″ bags. The article will tell you what thickness you need as well as places to get them. Make sure you get enough to last the season. I order a box at the beginning of the show season and have plenty as well as enough to use for getting rid of my culls. Many times the local Post Office has misunderstandings about shipping fish. We will get the rules and regulations and list them in this section as well. Best practice is never to list live fish on the outside of the box. 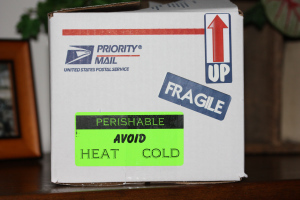 It is better to mark the package perishable and avoid heat and cold. And if possible, establish a good relationship with your local PO. Not only will you be shipping fish but receiving them. It is nice when you can call and get them to open a back door and give you your imports rather than wait another day. Most will find your hobby interesting and they become a good person to have in your corner when you box gets lost.